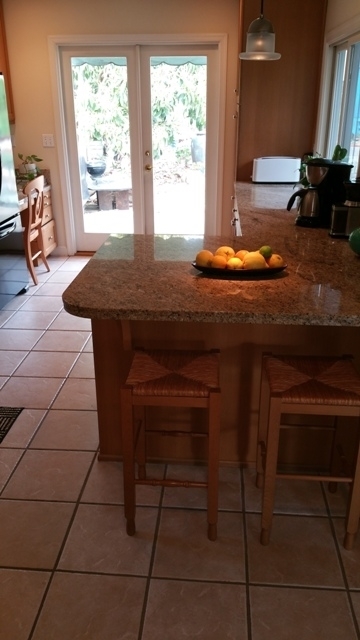 A very small outdated kitchen/dinette area was transformed into 2 separate spaces. The kitchen was redesigned into a dining room. The spacious kitchen is an addition. Before, Pic 1. Kitchen to be renovated into a dining room. Before, Pic 2. Kitchen to be renovated into dining room. After. New dining room, same view as Pic 2. French doors now open out to the patio in the backyard creating an open space plan. 12"x12" porcelain tile floor replaced the outdated linoleum floor. 6' wide entrance into the dining room replaced 30" doorway. Before. New Construction for kitchen addition. After. New kitchen addition completed. Lots of counter space and storage with a relaxed, yet timeless design. Maple stained cabinets with slab granite countertops. Black and stainless steel appliances. After. New kitchen addition completed. Breakfast bar front. Work desk by French doors leading out to patio in backyard brings the outdoors in.